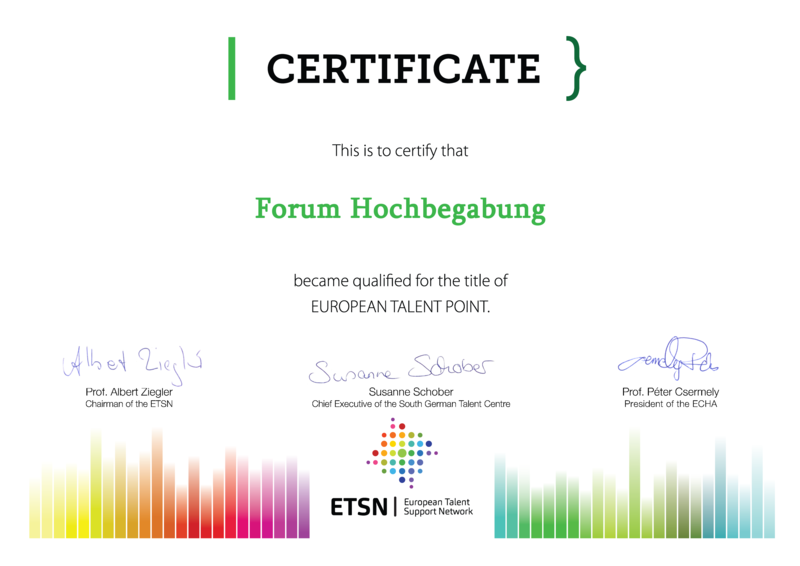 The "Forum Hochbegabung" is the first TalentPoint of the European Talent Support Network (ETSN) registered in Germany by the European Council for High Ability (ECHA). We are very pleased that our long-standing work has received this professional recognition and appreciation. In the future, we will continue our work for the needs of gifted children and their parents, offer continuing education and support in schools, kindergartens and other institutions - strengthened by an interdisciplinary network of research facilities and institutions experienced in practice throughout Europe. In addition, we will work together with our network partners to provide appropriate and necessary gifted support. The “Forum Hochbegabung” is a community of interested people and a self-help organization of affected families and persons who, for professional or personal reasons, deal with this subject. We are financially and organizationally supported by partners like health insurances and other cooperative partners. - Groups for parents "Highly Gifted Children"
Our main task is to spread information about giftedness and the special needs of gifted children. We give advise to parents on their way to understand the needs of their children and to get the right support for their kids. Therefore we help to coordinate the steps that the affected parents have to do and we organize cooperations with other affected institutions. Another important function is to provide education and training and sharing proper research-based information on giftedness. In order to achieve these goals, we are focusing on regional, national and international partnerships and exchanges. We offer public lectures twice a year, and every 5 years a symposium with competent and well-known speakers from research and best practice.